The AP384 P30XL non-sterile tips are designed to work with the Biomek 384-multichannel head. These tips offer an extended, narrow length of 43 mm, which allows pipetting from the bottom of deep labware to retrieve valuable samples. The tips also provide a larger transfer volume capacity of 50 µL, an additional 20 µL over the standard P30 tip. 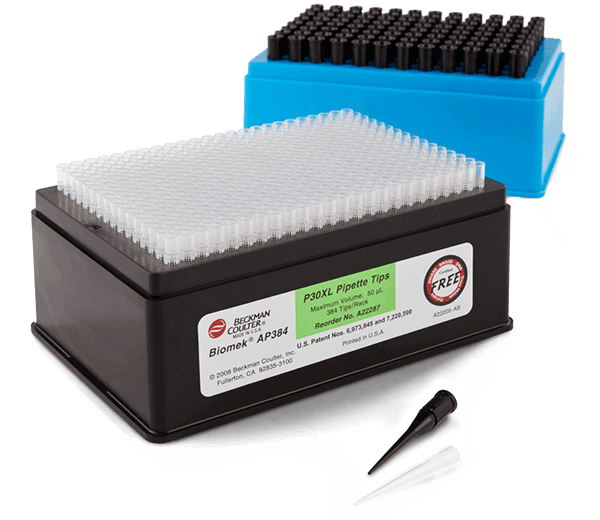 The AP384 P30XLs are 100% polypropylene, automation-grade and manufactured to ensure straight, leak-proof products free of DNA, DNase/RNase, PCR inhibition, pyrogen/endotoxin and trace metals. Case of 10 racks.